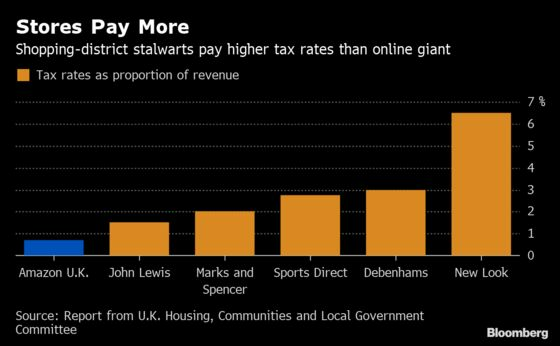 (Bloomberg) -- Internet retailers such as Amazon.com Inc., Asos Plc and Boohoo Group Plc should pay higher U.K. taxes to help save ailing shopping districts that are losing revenue to e-commerce, according to a government report. Asos shares fell as much as 3.2 percent in London, while Boohoo’s declined as much as 2.7 percent. Brick-and-mortar retailers pay more than their fair share of tax, while online retailers are not contributing enough, the report said. Amazon’s rates amount to around 0.7 percent of its U.K. revenue, while most street-based retailers pay double to eight times that. The tech giant already faces the introduction of a U.K. digital tax from April 2020. Amazon said it pays taxes in the U.K. and all countries where it operates and has invested more than 9.3 billion pounds ($12 billion) in the U.K. since 2010. The retail sector accounts for about 5 percent of the U.K.’s gross domestic product and pays 25 percent of business rates, according to the government report. Mike Ashley, the billionaire owner of Sports Direct International Plc, told the committee in December that e-commerce is the biggest threat to the U.K.’s shops. As a strategy to encourage retailers to keep physical stores open, he proposed a 20 percent tax on retailers that make more than a fifth of their sales online.